Pedal Cruiser pedal boats by Kay Park-Rec Corp. are simply the best commercial rental-duty boat on the market today. Pedal Cruisers have reinforced fiberglass construction, self-draining seats, pedal wells and pontoons, and regreaseable bearings, all of which makes life easier for the rental operator by preventing downtime and maintenance. Kay Park also manufactures a full line of "America's Finest" park equipment, including picnic tales, benches, grills and more. Leisure Craft recently introduced a new series of designer lockers. These attractive units are equipped with a "key-less" computer lock system that allows multiple users. One, two, three and six-tier configurations are available. Solid melamine panels are available in eight attractive colors. These versatile lockers are ideally suited for schools, hospitals and recreational facilities. Various options are available for customization. Sol Inc. introduced its next-generation solar light intelligence. AiSUNTM operates as the brain, heart and nervous system of a solar light, making them brighter, more efficient and less complex. The new aiSUNTM is an innovative combination of solar energy controller and LED driver in one unit. The electronic intelligence ensures reliable operation every night, and allows for integration of control inputs so that customers have light when required. It converts and stores solar light energy during the day, and at night powers high-flux LED lighting from the reserve energy. AiSUNTM is available in a wide range of Sol Inc. solar light systems. The Surface Mount 2000SM is the newest model in the HydrationStationTM line. This new model still features patented touch-free hygienic water-dispensing and is easily installed on virtually any indoor wall. The new Surface Mount design allows model 2000SM to be placed securely in multiple locations without taking up excess space and only requires a 110-volt outlet and a water supply. Model 2000SM features a 30-second timeout function that prevents unwanted use, is antimicrobially protected, which helps protect against mold and mildew on silver-treated components, and a state-of-the-art water filtration system ensures great-tasting, polished water to all users. The Script Series is a bench series of expressive, fluid designs that mimic the natural flow of the great outdoors. The S-100 bench with back uses freeform lines in thick and thin weights suggesting a calligraphic testament to good taste. All benches consist of cast aluminum pedestals and wood or recycled plastic slats. 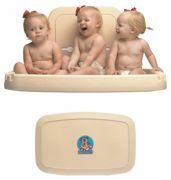 Koala Kare Products introduced its reengineered and redesigned KB200 Baby Changing Station. Major features are all-new contemporary design and the Bear-of-a-ChassisTM , able to hold a 200-pound static load. Engineered to provide virtually no deflection, the KB200 substantially improves safety and parental peace of mind. The heavy-duty, multi-point mounting chassis features 11-gauge steel unibody construction, and the bed provides a seamless finish. KB200 represents a dramatic redesign of Baby Changing Stations, incorporating contemporary styling, durability, stability and built-in Microban® product protection, which inhibits stains, odors and deterioration. Available in four colors, the KB200 is available with a new Earth Tone version to meet contemporary interior design objectives. Sansin Enviro-Stain features separate formulations for docks, decks, fences, wood siding, porches, log homes and interior walls and ceilings. Features very low VOCs and no toxins. Nano technology. High depth of penetration to cellular level. Allows wood grain to show, and lets wood breathe. No surface egg shell film building, no moisture captured and no decay. Doesn't show scratches like film building products. No blistering or peeling. Water cleanup. Very friendly to environment. Many color selections. SeaKlear® now offers new Enzyme Klear for both pools and spas. Enzyme Klear is a natural enzyme that eliminates oils, lotions and organics in commercial aquatic facilities, which reduces the maintenance required for filters and spa surfaces. Ideal for commercial aquatic facilities, this product destroys scum lines and odors and is biodegradable and environmentally safe. Compatible with bromine, chlorine, ozone and peroxide sanitizers.